Mike Imrem: Step back and take a deep breath. Nobody sits on the edge of their chair in suspense over the Major League All-Star Game. It’s not the World Series. It’s not the Super Bowl. It’s not the NBA Championship. But it’s fun. Mike, I understand you’re upset about the commingling of league personnel in the American League and the National League, but it’s not the end of the world. Remember Dr. peter Venkman in Ghostbusters: “Human sacrifice, dogs and cats living together… mass hysteria!” We’re not there yet. I wouldn’t care if they brought Chet Lemon out to coach third base for the National League. Going both ways doesn’t bother me, but I’m still loyal to the American League. The rivalry is still there. But it’s for fun, not blood. All-Star night is time to recover from going all-out over the 4th of July holiday. It’s time to enjoy the middle of summer. It’s a time for Dads to flip on the old TV in the garage and tinker with the lawn mower while the All-Star game is on in the background … or work on the kid’s batting swing on the driveway while the AL and the NL “duke it out.” Singles might head out to Fox & Hound and watch the game on the big screens. You’re going to watch NCIS? Unless you’re home with a broken ankle, a bad case of asthma, or recovering from Dengue fever; who watches TV reruns inside on a beautiful summer night. You say the All-Star game was concocted, but there’s some great history in the concoction. The first All-Star Game was held in conjunction with the 1933 World’s Fair in Chicago, Illinois at Comiskey Park. The All-Star game was the creation of Arch Ward, who was sports editor for The Chicago Tribune. The All-Star game was planned to be a one-time event, but its success resulted in making the All-Star game an annual event. The All-Star Game’s most valuable player yearly award — the “Arch Ward Trophy” is recognition of Ward’s contribution as recognized by Major League Baseball since 1962. It’s must-see TV, especially for Chicagoans this year, for their last chance (probably) to see Tony La Russa — former manager of our beloved Chicago White Sox — perform his duties as manager for the National League. For the rest of the nation and world, and St. Louis Cardinals fans, it’s their last chance (probably) to see World Series champion manager Tony La Russa manage one more time. 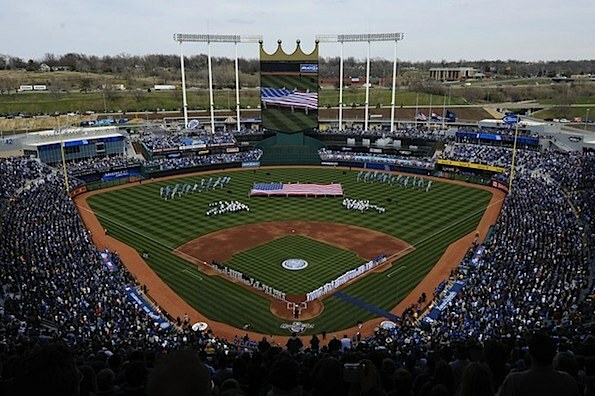 Newly renovated Kaufman Stadium looks really cool. I’d watch the game just to get ideas for renovation for Wrigley Field. If only Mayor Rahm Emanuel would quit playing politics and get over his grudge with Cubs big daddy Joe Ricketts and the super PAC Rev. Jeremiah Wright-Obama attack ad controversy. So Mike, are you really going to be sitting inside watching a rerun of NCIS? Send me a picture of you sitting in your living room with NCIS in the background, and I’ll publish it tomorrow. Or post it on the wall of Facebook.com/ArlingtonCardinal. Everybody else? Send us your pics of fun during the All-Star game (Facebook.com/ArlingtonCardinal) or just share what you were doing while you watching the All-Star game. It’s complicated, but don’t let it be. Now let’s see, do I root for La Russa or the American League?